Description: Sexes similar. 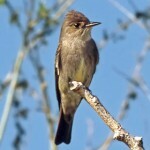 Olive-gray back and wings; medium gray head and breast; relatively short bill; contrasting white chin; dull yellow belly; and dark brown tail that lacks white edges on outer tail feathers as in Western Kingbird. Orange-red crown patch is usually concealed. 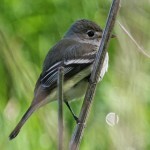 Juvenile is duller, browner above, and paler below. Habitat: Associated with dry, open habitats such as plains and semi-deserts, where there are only scattered tall trees. 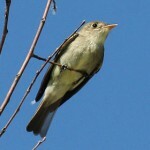 Where in Nebraska: Uncommon spring and fall migrant, and regular summer resident in the western Panhandle. No definite nesting records, but surely breeds in Nebraska. 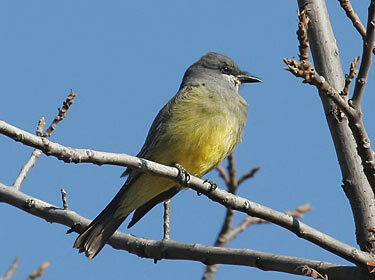 Field Notes: Overlaps widely with the Western Kingbird, and probably competes locally with it. Fun Facts: During courting Cassin’s Kingbirds fly and hover in the air together with outstretched wings and high-pitched calls sevearal times a day.